The standing rigging that came with the boat when I bought her was not satisfactory, because the stainless steel shrouds were far too short. The lower ends of the bottle screws were about a foot short of the chainplates! The top of the furling rod was held in place by a lashing instead of a stainless steel strop. I also discovered that the bottle screws were made from different metals, i.e., steel and bronze, so that the threads became seized; in fact when I tried tightening a bottle screw it snapped. I’m glad it happened then, because I wouldn’t have wanted it to fail when I was sailing ‘Sandpiper. For now, I’m using lanyards instead of bottle screws, but if I find I am unable to achieve sufficient tension on the forestay I’ll replace the lanyards with bottle screws. 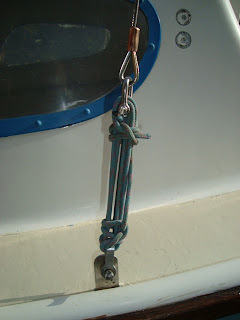 An advantage of lanyards is that they do not twist and become snarled as the mast is being raised. 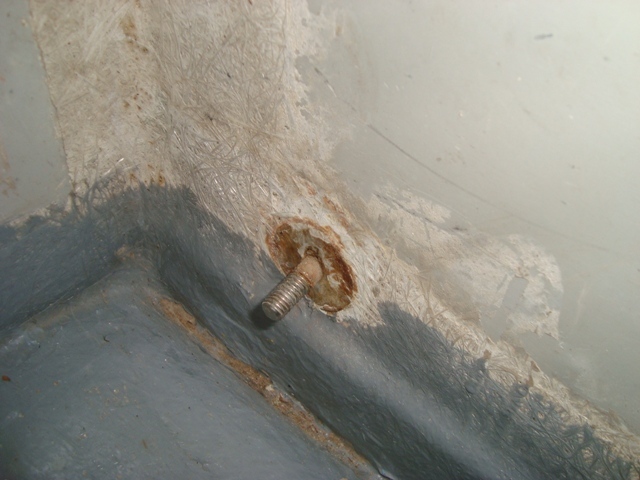 There is no need for a bottle screw at the bottom of the forestay. 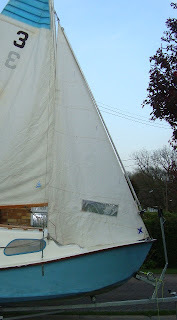 I have added a topping lift, because it will help when it comes to putting a reef in the mainsail, and I shall be able to rig a boom cover over the cockpit – especially useful if it rains when the boat is at anchor. 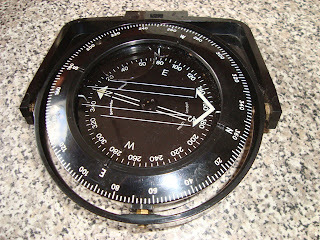 I was not disappointed with the Sowester Bosun compass I acquired by bidding at Ebay. I took a risk that paid off. When it duly arrived at my doorstep I anxiously opened the parcel to examine the compass which I knew full well had a large bubble under the glass. What I didn’t know was how to go about replacing the missing liquid. I didn’t even know what type of fluid it was. I gambled that liquid from an old, obsolete compass that I had no intention of using would be suitable. 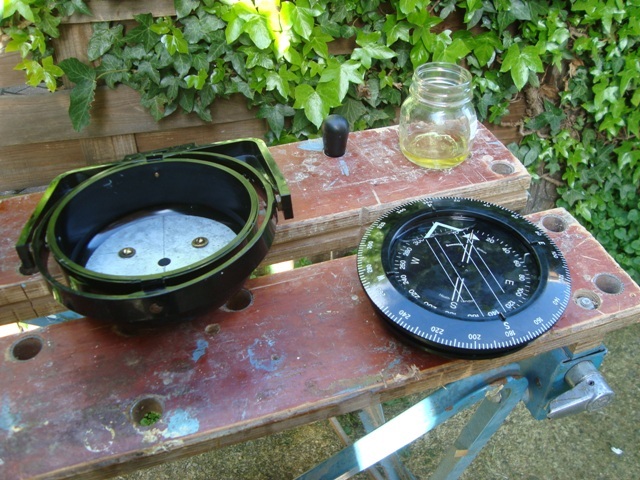 After examining the Bosun compass I discovered that if I extracted two plastic-type screws from the outer side of the casing, the actual compass could easily be removed. I immediately observed a large screw that plugged a hole through which I could replenish the liquid by using a surgical syringe. I undid the screw and administered the life-giving fluid. By gently rocking the compass a little from side to side I could release a few tiny bubbles that remained, and continue filling the bowl until full. Regarding the nature of the liquid, it certainly was not gin! - More like clear, good quality paraffin, because of that fluid’s characteristic smell. I didn’t notice any difference in appearance or smell between the two liquids. I assume they both have the same viscosity, and I trust there will be no ramifications if they do not. Just now, I am very happy with ‘Sandpiper’s’ cheap, but practical compass. May that continue as I make use of this essential item. 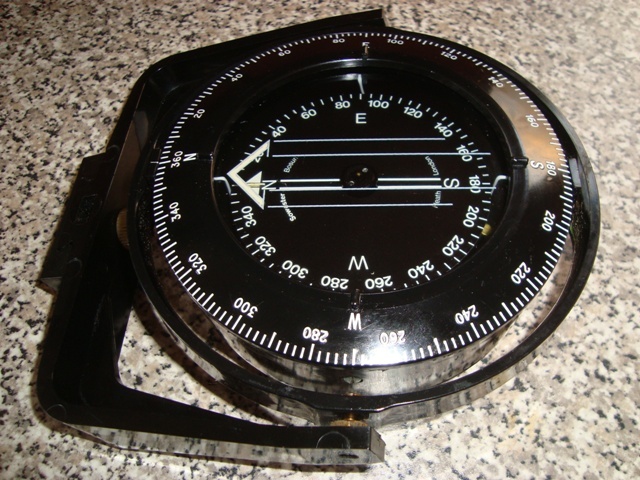 The best compass I’ve ever had for a boat was the Sowester Bosun Grid Compass. A grid compass beats all others for steering a yacht because the helmsman does not have to remember the boat’s heading. He simply keeps an eye on the compass to make sure the north/south needle is central between the sides of the grid. He must also ensure that the north end of needle is pointing to the north end of the grid which is usually identified by a ‘V’ or arrowhead shape. 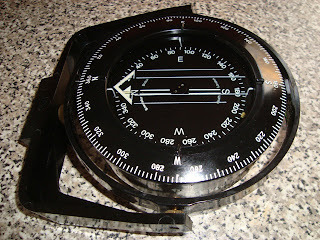 The rotating 360 degrees bezel is turned until the desired compass course is set by lining it up with the indicator at the forward end of the compass. Allowances should be made for variation, deviation, and tidal vectors. Deviation can be a bind if a yacht is built from iron, when it is best to employ a professional compass adjuster to do the job of setting up the ship's compass. If there is any deviation after the compass has been adjusted he will supply you with a deviation table - even in some instances allowing for the heeling of the yacht. For the past few days I’ve been keeping a lookout on Ebay for a Bosun compass. Four of them were available. I deliberately bid for one that had a bubble under the glass, knowing that the competition would not be fierce. In all, there were 15 bids, but it went for less than a third of the average winning bids for the other compasses. I was chuffed, and I hope I shall be more pleased when I have eliminated the bubble by adding fluid from an old, unwanted compass. I like the large size of the Bosun - 104 millimetres diameter across the viewing glass - which helps when steering the yacht, because all the markings are clear. At night the compass does not require a light, as it is illuminated with phosphorous markings. Very conveniently the compass can be attached to a bulkhead by slotting it into a small bracket which has a retainer thumbscrew. The total width of the supporting frame is 195 millimetres. 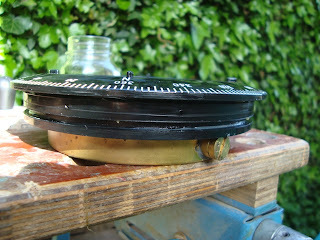 Mine has a second bracket that can be fitted within the cabin where the compass can be securely stowed when not in use. A skipper/owner worth his chalk will want to deepen his relationship with the vessel of his choice. Part of the process is exploring her physical makeup. At first there is the visual perusal which excites the mind and the emotions; this is followed by in-depth scrutiny to the extent that the examination becomes tactile. Only after the minutiae have been explored can there be a full understanding of what the relationship is all about. Some will say that a boat has no spirit, but few would not admit that a boat with great character does have a spirit, malevolent or benign, as the case maybe. Almost all would define the gender of a boat as female. 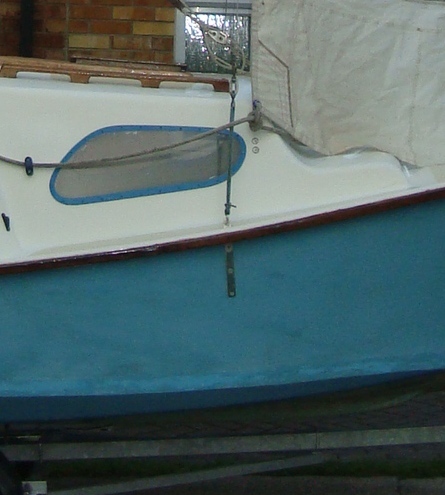 Only in this cuckoo age of neutrality and political correctness would a boat be classified as a neutered object. At least the French consider a boat to be masculine, but they are sadly wrong to call a boat ‘he’. Anybody who knows anything about boats will always refer to them as female. Experience will prove the point! Well, I have reached the second stage of my relationship with ‘Sandpiper’. I am exploring her in depth with microscopic eyes. She has many blemishes and one or two larger defects that will need attention. Between the rain showers I made a bold dash into her cabin with the purpose of examining the bolt that supports the galvanised centreplate. As far as I understand the system, the bolt does not pass through a hole in the centreplate; instead it passes through a slot so that the plate can more easily be removed from the centreplate case. Before that can be done, the sealing board that covers the slot at the top of the case must be removed to enable the centreplate to be lifted off the bolt. I am hoping I shall not have to lift the centreplate out of the case, but my initial investigation points to the fact that I shall have to make seals of some kind to prevent water entering the boat. As things are, water could seep between the bolt and the edges of the holes. The easiest solution would be to pack the area with a good flexible sealant and to place penny washers either side before tightening the bolt - not too much, lest the centreplate case could be damaged. In fact, the case has been repaired forward of the bolt by the application of a layer of fibreglass, not perfectly done, but sufficiently well to strengthen that area. If I am offshore, I need to be reassured that ‘Sandpiper’ will not spring a leak and that ‘she’ will be able to cope with inclement conditions. 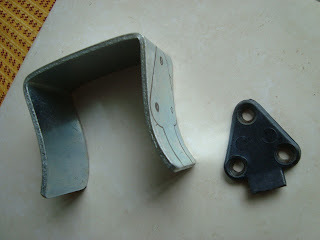 ‘Sandpiper’s’ plastic rudder retainer broke because it had become brittle over the years. Plastic of that type can degrade if subjected to sunlight for any length of time. Before the boat could be launched, one of my priorities was replacing the retainer; therefore I either had to buy another or make my own. I thought I would have a go at making one. I looked through a number of items I keep for this sort of thing, and I selected a few odds and ends that might be suitable. At first I tried making a stainless steel retainer, but drilling holes through exceptionally tough metal proved too much for my drills. A piece of plastic similar to the sort from which the old retainer was made seemed the next best thing. I found a bit and cut it to shape after drilling holes for the fixing screws. Instead of copying the shape of the old retainer I made mine stronger by shaping it rectangular. To achieve a permanent bend in the plastic I gently heated it over a flame while flexing the material. When I attached the retainer to the transom I sealed the fixing screws with clear silicone sealant. I tested the device, and I think it should do the job well. If the gadget fails, I only have myself to blame. 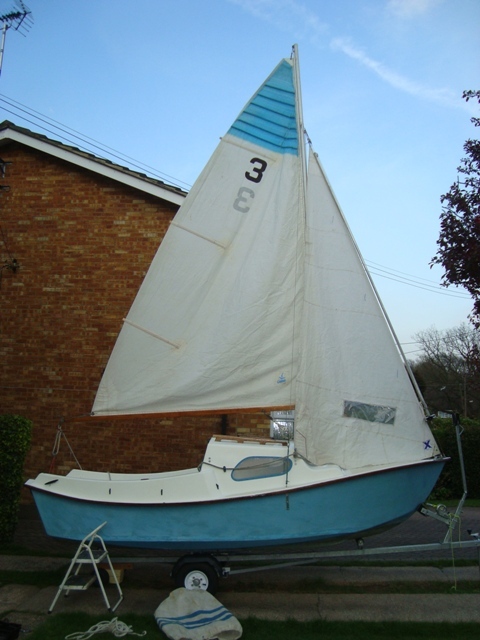 A sailing boat without a rudder is like a lame duck; consequently I hope my faith in the fixture will be justified. The job of reshaping and repairing ‘Sandpiper’s’ sails took considerably longer than I anticipated, but they are now finished and they should be good for another two or three years. 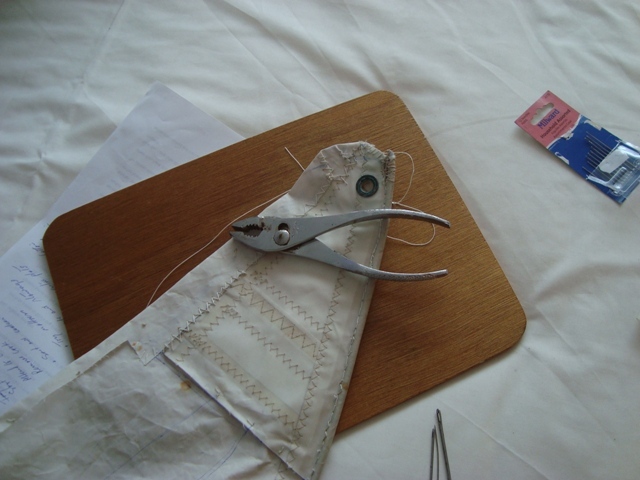 I mislaid my sailmaker’s palm, and I was reluctant to buy another; instead I managed with pliers and a coin which was handy for applying pressure to the eye end of the needle, or should I say needles; as I broke and bent several of them. Finally, I found one that was almost indestructible. 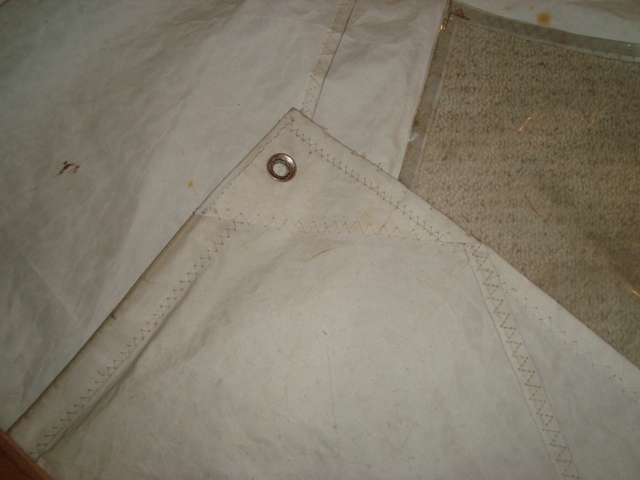 The mainsail did not require reshaping; however, worn stitches had to be replaced, and all three batten pockets had to be strengthened at their openings where they were worn. I cut the hickory battens to length, because they were too long. I am pleased with the finished sails, especially the jib that I re-cut along the foot and leech. Both sails set pretty well too. There are a number of things that have to be attended to before the boat can be launched. I have to replace the rudder stop, because it snapped, on account of being brittle. The draining system for the cockpit and the aft deck has to be cleaned and reassembled. A major consideration will be the engine. Shall I be able to get away with a short shaft outboard? A long shaft one will be more difficult to store and it will be more expensive to buy. My preference would be for a Honda 2.3 four stroke outboard. I doubt there’s a better engine for a small boat. I very seldom keep a boat for any length of time, and true to form I have sold the most recent one built by me. I was swayed by passion when I made the decision to go ahead to build her. 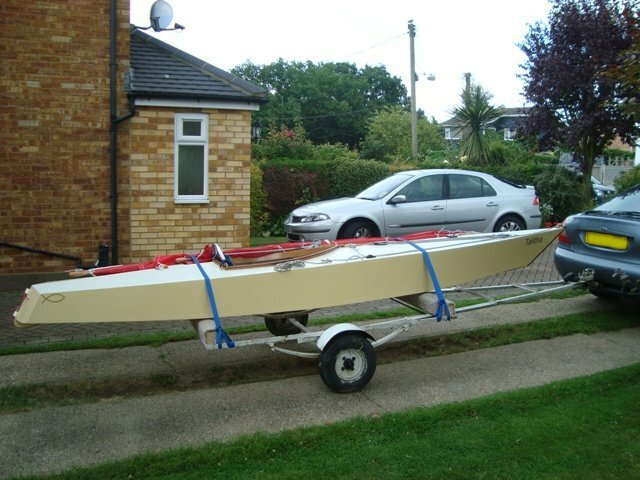 The original Sharpy roof rack keelboat was on display at the Beale Boat Show several years ago. There I fell in love with her, just as King David fell in love with Bathsheba when seeing her for the first time, but I did not sin by killing a person to satisfy my lust. (2 Samuel 11) Years later the vision remained, and I desired to have a Sharpy of my own. I telephoned Derek Munnion who designed and built the boat I saw at the Boat Show, but he would not sell her. He cherished her too much to let her go. Once again, I did not resort to murder in order to have her; instead I got hold of the building plans and put a lot of effort into building my very own Sharpy. 'Sandpiper', a West Wight Potter - my latest mistress. Decisions once acted upon cannot be undone. The past is finished and never again will it be repeated. There’s only one way to go after making a bad decision, and that’s to go forward; be positive and optimistic for the future. To that end I have bought a Type ‘C’ West Wight Potter and I’m in the process of making her ready for a spot of local cruising and pottering. If all goes well, I’ll take her further afield, perhaps to the West Country where the water is bluer and the scenery is great. 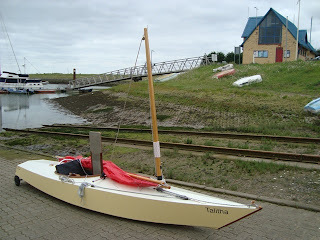 For day sailing, ‘Talitha’ fulfils the bill admirably, and no doubt she would be great to take to locations when camping. I envisaged doing this, but I realized camping ashore was not my forte; I much prefer to sleep aboard my boat which gives greater flexibility. 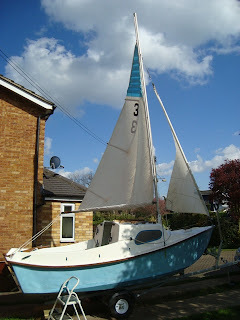 I hope and trust ‘Talitha’s’ new owner will have much fun sailing her. I wish him all the best. He’s got an absolute bargain, and she is the best built of all of my boats. He will not be disappointed. Yesterday I tried ‘Sandpiper’s’ furling jib, and it worked a treat – no snagging of the line, and the action was very smooth. 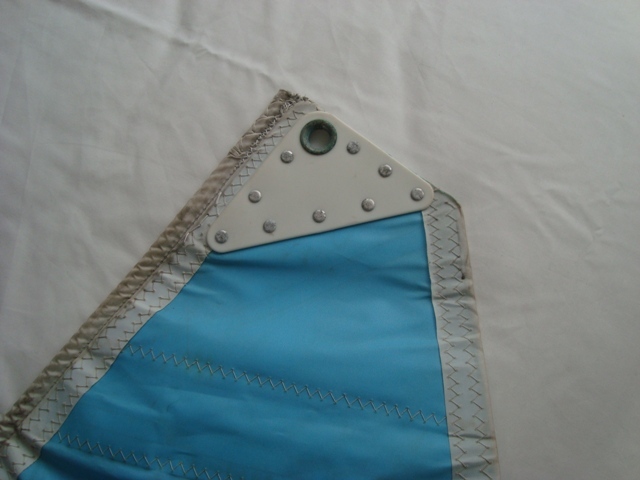 One of the advantages of a furling foresail is that it does not need a lot of tension on the halyard because the luff of the sail is kept straight by virtue of being snug within the groove. In fact, ‘Sandpiper’s’ jib set perfectly, without the tack being under any tension whatsoever, because the tack cringle had not yet been fitted. I was able to ascertain the exact position for a cringle, and today I set it in place. The only improvement I could make to the sail would be to strengthen the leech to ensure it will withstand a strong blow and to give the sail longevity. The forestay around which the furling rod rotates must be taught to prevent the furling rod from bowing. 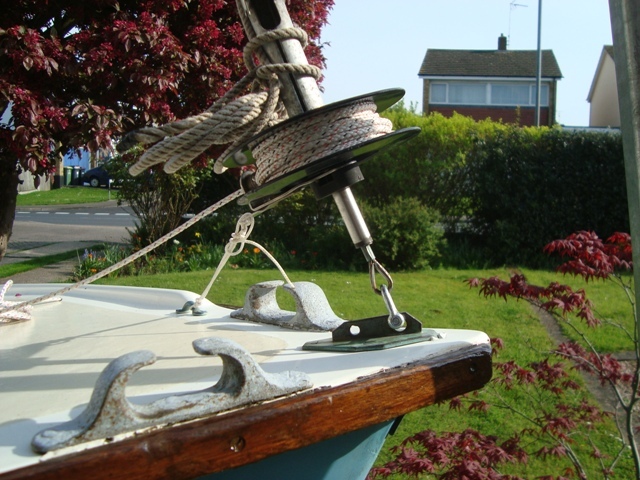 A taught forestay also facilitates the furling action. 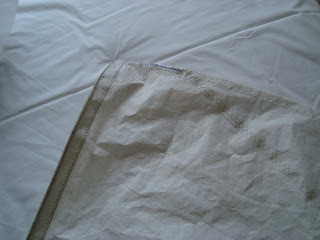 The required tension is achieved by adjusting the shrouds, rather than the forestay which does not have a bottle screw. 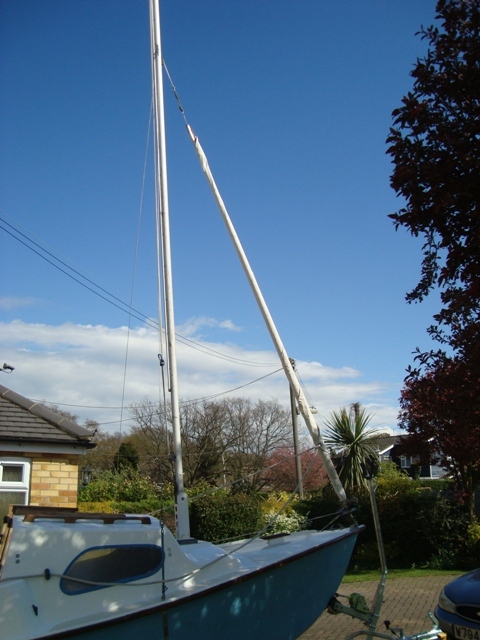 ‘Sandpiper’ does not have a backstay, nor does she need one, and at the moment, she does not have a topping lift. I shall most likely add a topping lift, because it will help when it comes to reefing the mainsail. The weight of the sail and boom is primarily taken by the topping lift while the sail is rolled around the boom. If I can find time tomorrow I’ll do some maintenance on the mainsail which I’ll be able to do indoors. This typical showery April weather is hindering out-of-door boat maintenance, but the rain is most welcome, on account to the drought. 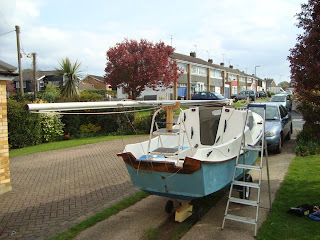 I’ve nearly finished reshaping and sewing the jib. 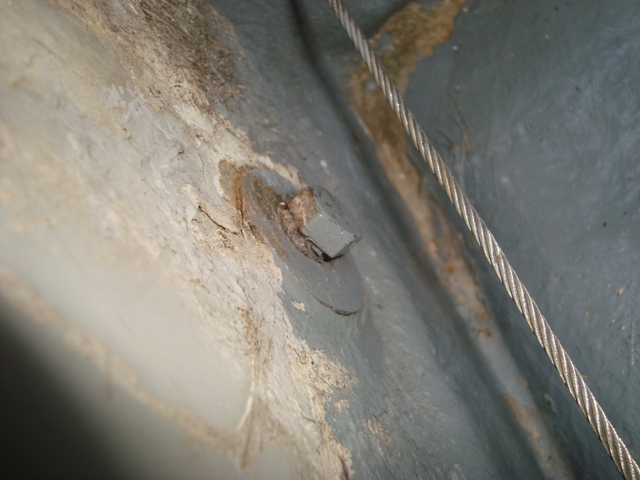 The tack has to have a cringle or a rope sewn into it for linking it to the base of the furling rod. The mainsail requires a few stitches here and there. 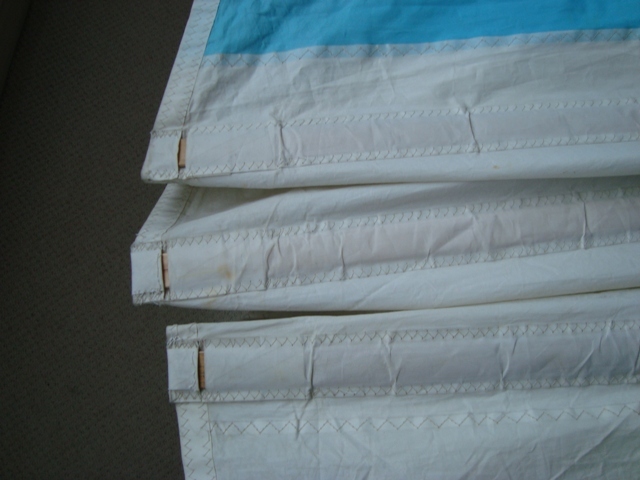 The battens are too long, but I could leave them as they are - that's if I sew retaining tapes into the leech. Today I tested reefing the sails. The furling jib worked well, and I found that I could roll the boom for reefing the mainsail to good effect. 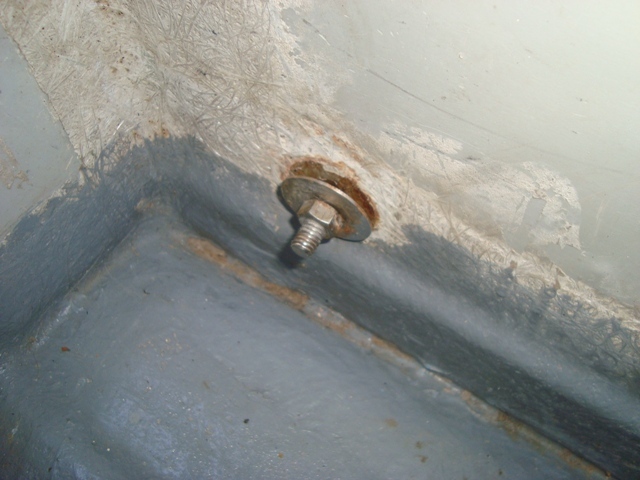 By way of a change from sewing sails I made a start at cleaning two small drains by the aft locker. Because the cockpit seats slope towards the transom, rainwater lodges between the aft rim of the lazarette and the transom. When the drains have been cleared the problem will be eliminated. There are many improvements I could do to the interior, but for now I’ll keep things simple by storing equipment and provisions in waterproof bags and plastic containers. The boat does not have a depth sounder, a compass, a cooker or a chemical loo. Basically, she’s a dinghy with a lid. The previous owner gave me an old corroded compass, but if I decide to use it I shall have to make a suitable bracket, as there is no means of attaching it to the boat. Well, I am enjoying playing with ‘Sandpiper'. May the fun continue. As I now have two boats and I need space for the new arrival, I have dropped my asking price for ‘Talitha’. She’s advertised at Ebay.co.uk for £700.00 with offers. I shall accept the best one, providing it meets my reserve. To see the advertisement, key this number (160784608686) into the Ebay search box. She’s a really good boat with a first-class performance, ideal for lake or freshwater sailing. The only reason I have placed her for sale is because she does not have accommodation for me to sleep aboard. My new boat, a ‘C’ Type West Wight Potter, has a cabin with enough space for me to live aboard for days at a time. 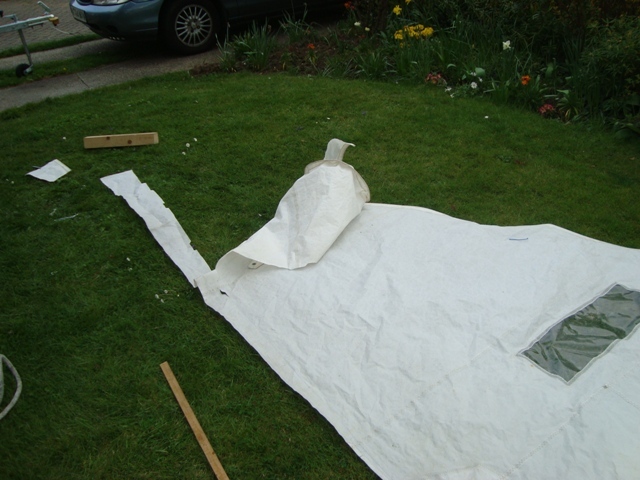 Today I have made more progress at shaping the furling jib for the WWP. 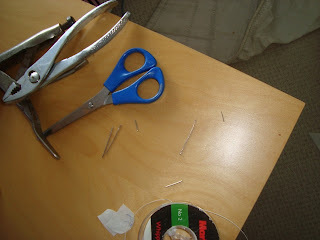 The alterations are being done entirely by hand, as I do not have a sewing machine. I’ll get there eventually, and I trust I shall be satisfied with the result. I have had surprisingly little time for playing with the boat; perhaps tomorrow will be different. However, I’ve made some progress towards preparing ‘Sandpiper’ for the water. 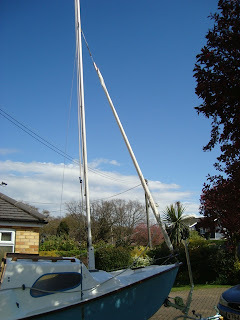 My priority is to finish transforming her overlarge jib into a furling one of the right size. All that remains to be done is a small amount of stitching. I have reshaped the leech and removed a section of cloth near the top. Hopefully, the sail will be finished by tomorrow morning and I will test it with the furling gear. The head of the sail requires a few more stitches. This is not an elegant job, but it will be strong. 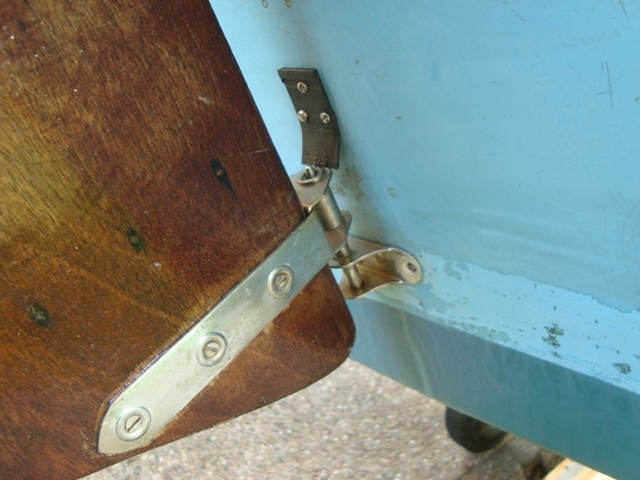 I strengthened the slightly cracked furling drum by placing a jubilee clip around its upper section - in fact, this remedial action has made the drum stronger than when it was manufactured. I can now raise and lower the mast easily and quickly by using the tabernacle. At first I thought this could not be done, because the cleats were in the way, but I discovered that as long as I placed the mast on the centre line between the upright sides of the tabernacle, the system worked. After it has been set up, wooden cheeks are slotted into place either side to prevent it moving. By tightening the shroud lanyards when the mast has been raised I may be able to satisfactorily provide sufficient tension on the forestay to ensure that the jib furling rod rotates effortlessly. Ideally, I should have new shrouds made to the correct length to eliminate the lanyards. ‘Talitha’, my roof rack keelboat needs to be sold, as I do not have room for two boats. I am open to offers. Please get in touch by phoning me at 07588288060 or email me: barnacleid at yahoo dot co dot uk. The sails, but not as they should be. Note that the foresail is not slotted into the furling rod, and the luff of the sail is too long. Before I bought ‘Sandpiper’ I researched West Wight Potters with a view to buying one. I had already travelled to Hayling Island to see a ‘B’ Type, but she was far to cramped within her cabin. ‘Sandiper’ has more useable space, which is one of the reasons I parted with my money. Another reason for buying her was her furling foresail. However, I was shocked to find that the sail did not fit the luff rod, since the luff of the sail was far too long and it was impossible to thread it into the groove! Instead of a luff rope the sail has a wire one. When I examined the boat before shaking hands on a deal, I mentioned to the owner that I had never seen a furling jib with a wire luff. I must have been half asleep, because bells should have rang, warning me that things were not quite right. Bottle screw - short of the chainplate. More surprises were to come. Today, when I tried placing the mast in the tabernacle, prior inserting the pivot bolt, I could not do it because the halyard cleats were in the way. The only solution was for me to stand on the foredeck while holding the mast vertically so that I could drop it into position; but even then I had to raise the mast about 4 inches from the base plate before the pivot bolt could be passed through the mast and the tabernacle! I noted there were lengths of cord tied to the bottle screws, but I believed they were there for temporarily tying the shrouds to the chainplates. 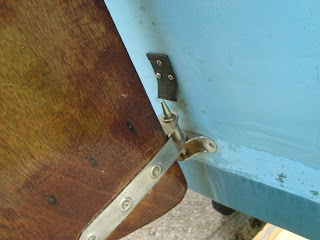 The forestay didn’t reach the stem head fitting, which meant I had to lengthen it by attaching a short strop. I was astonished to discover that the shrouds also did not reach their chainplates. Even if the mast was lowered to the base plate, I doubt the standing rigging would be long enough. Furthermore, the luff of the jib would be too long! What do I do now? 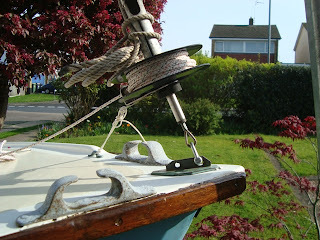 I could add strops to the shrouds as I did to the forestay. I could cut the luff wire at the head to remove the cringle that prevents me from threading the luff into to furling rod, but that would not be an entirely satisfactory solution. The better, more expensive option would be to have new standing rigging and a new furling foresail. 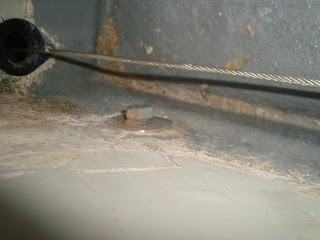 A close inspection of the plastic furling drum, revealed there was a small crack at the top of the channel through which the forestay passes. I shall need to re-examine the fault to assure myself that it will hold. I am left with a few decisions as I reflect on how foolish I was not to have seen the rig set up before I bought the boat. However, when viewed within the context of ‘messing about in boats’, I know it is all part of the fun. She will be made right. She will be a good boat. I must continue on this positive note. Nothing very much has been happening on my blog for a few weeks because there’s been little to write about. Since before the end of last year I have been looking for a new project, and I was uncertain as to what form it would take. I was reluctant to commit myself to building another boat, which led me to look for a second-hand one that I could improve. 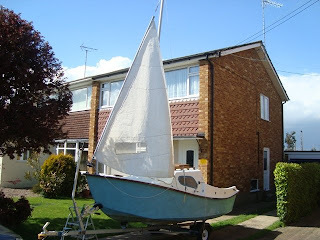 After seeing many boats I narrowed my quest to a sailing boat similar to ‘Faith’, my old Paradox – a vessel that could fit into my garage and be taken by road to new cruising waters. As there were no Paradoxes for sale in the UK, the next best thing was a West Wight Potter, preferably one of the later models. Search as I did, I could not find a suitable Potter, until today, when I chanced upon an advert for a ‘C’ version. Only a few days ago I looked at a West Wight Potter ‘B’ type, but I felt she was rather too cramped within her cabin. The ‘C’ model has longer bunks that extend under the cockpit seats, both on the port and starboard side. Another advantage of the latter is her small sliding hatch that makes getting in and out of her cabin easier than the ‘B’ type. 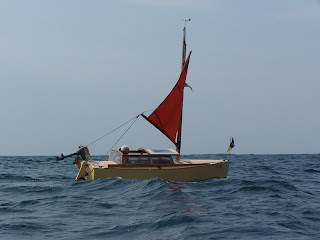 My Potter has a Bermudan rig with a furling jib, unlike the ‘B’ version that has a Gunter rig. 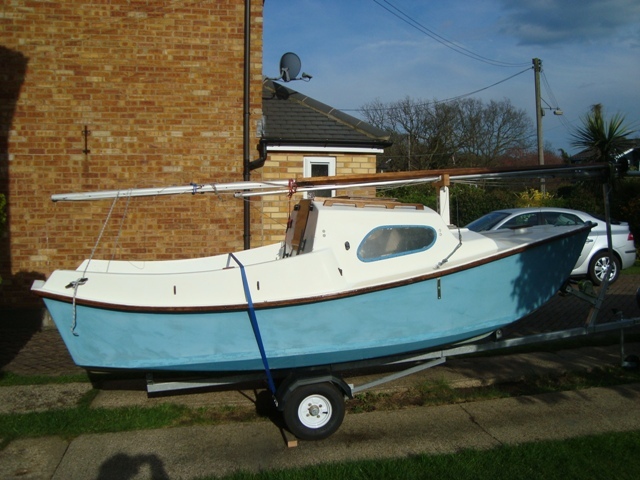 ‘Sandpiper’, for that is her name, didn’t come with an engine; therefore I’ll have to find one, because it will be helpful when the wind drops. Here in the South East of England large tides generate fast currents. When the wind is contrary to the moving water, conditions can get a bit bumpy, and rowing a WWP when it is like that will not be fun. I shall need an engine without a doubt. Yes, I know Charles Stock managed his ‘Shoal Waters’ without an engine, but a West Wight Potter is so very different to his converted Fairey Falcon, and more to the point, I’m not Charles! Like the boats, we are so very different. 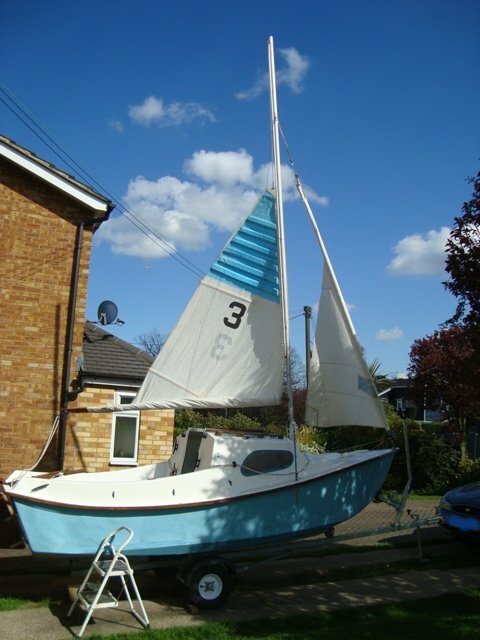 Incidentally, I’ve broken my lifetime rule, never to own more than one boat at a time. ‘Talitha’ will have to go to make room for my latest acquisition. If you think you may be interested in owning her, come and see – and perhaps make an offer.